This page will introduce a partition tool for Windows 2008 Server 32 bit users to resize hard disk when it is running out of disk space. Download IM-Magic Partition Resizer Server to reallocate disk space on Windows Server 2008 32 bit Operating System. Are you wondering what to do when any of partition is running out of disk space on Windows Server 2008 32 bit Operating System? Do you want to repartition hard disk but you are worried about data loss due to repartitioning? In fact, you can resize hard disk on Windows Server 2008 by using partition software IM-Magic Partition Resizer Server. It allows you to move free space from one partition to another with all data untouched. This partition software is a professional Windows Server partition tool, which can works on almost all Windows Server OS. 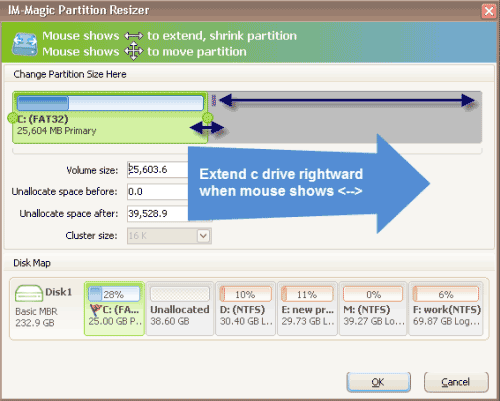 You can follow the guide below to perform partition resizing. Download, install and launch the IM-Magic Partition Resizer Server on computer. Right click a partition that has much free space and choose "Resize/Move" option. You need to move the arrows to decrease the size of the selected partition and then you can get some unallocated space. "I am running Windows Server 2008 32 bit Operating System on my computer and I meet a problem recently. When I turn on my computer, Windows system reports a low disk space warning message on C drive (system partition). 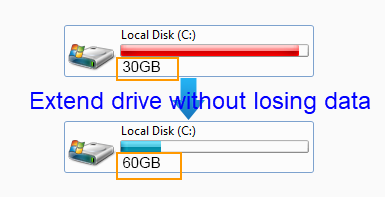 I have another two partition D and E on my computer, so I am wondering if I can move some free space from D drive or E drive to C drive with reformat the disk or losing any data. Noticed that Disk Management has the function of resizing hard disk, but I can only shrink volume. I cannot proceed because the Extend Volume option is grayed out when I attempted to extend C drive. Can anybody tell me why Disk Management failed to extend C drive or is there any other solution for C drive expanding on Windows Server 2008 32 bit?" "The system partition only has little free space left on my PC which runs under Windows 2008 Server 32 bit, so I want to extend the system partition. Can somebody recommend any useful partition tool which enables me to increase size of system partition without reinstalling system?" If you need to extend C drive on 32 bit Windows Server 2008, you can rely on partition software which can be compatible with all Windows Servers. IM-Magic Partition Resizer Server has the ability to resize hard disk on Windows 3008 32 bit without formatting hard disk or deleting any file from any partition. You just need to perform a few mouse clicks to resize C drive when it is running on low disk space by using the partition software. Even if system is installed on C drive, this partition software enables you to extend system partition without hurting the Operating System. You can increase size of C drive without reinstalling system or having any influence on the performance of your computer. Why Disk Management Failed to Extend Partition? If you have ever used Windows Server 2008 Operating System, you may know that Disk Management on Windows 2008 enables its users to manage disk space in a better way. It has the function of shrinking volume and extending volume, so that you can resize hard disk without repartitioning hard disk. Usually, as long as there is enough free space, you can shrink a partition easily under Disk Management. The difficult thing is that you cannot extend volume even if after shrinking volume to creating some unallocated space. Why? Well, the problem is that the unallocated space is not right adjacent to the partition you want to extend. In the other words, adjacent unallocated space is needed in order to extend a volume under Disk Management on Windows Server 2008.